I know, I know. I’m four years late reviewing this game. 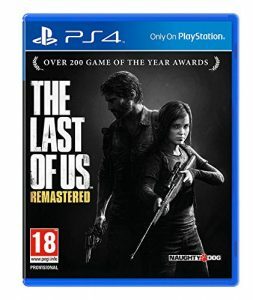 Naughty Dog released it in 2013 for the PS3 (I played the remastered version on my PS4) to critical acclaim, great sales, fantastic customer reviews, and glowing praise. It won over 200 Game of the Year awards. It’s because of the acclaim that I decided to not only purchase the THE LAST OF US — I had to buy the console as well. I am generally an X-Box person, and haven’t had a Playstation since the first one and my days enjoying TWISTED METAL. THE LAST OF US is, however, a PS exclusive. One of the great elements of this story is the relationship between Joel and Ellie. Joel is recovering from the death of his daughter twenty years earlier, something he thought he had put behind him. But when Ellie enters his life, his reaction is to push her away and simply do his job. As the journey progresses, however, as they hit obstacle after obstacle and have to work together to survive, he finds himself growing closer to her and coming to terms with his loss all those years before. 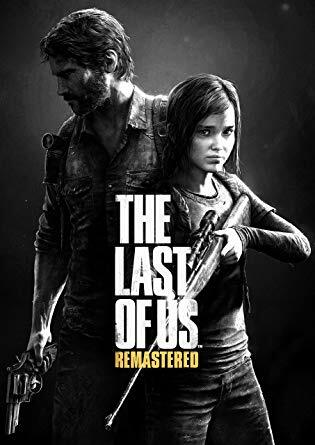 To those who would say that video games are not a legitimate method of telling a compelling story, I would point them to THE LAST OF US. It’s an incredible emotional journey, and the story is riveting. 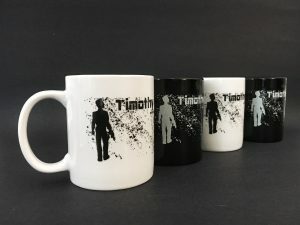 It has elements of the zombie craze, and the closest comparison in conventional storytelling would likely be THE WALKING DEAD. Joel and Ellie are not just evading those who are “infected,” they’re also evading gangs of humans looking to capitalize and prey on the weak. This includes bands of cannibals, thieves, murderers, and raiders. The ancillary characters are well-developed with layers of motivation and history that the gameplay slowly reveals. Moreover, the cordyceps fungus “infection” has a true scientific foundation, and while characters or clues don’t say much about it, the possibility at least is there. It could happen, and the resulting collapse of civilization, social norms, and sanity seems to occur with violent realism. Obstacles include broken down and burned-out cities, towns, villages, forests, a university, a hospital, sewers, a ranch, highways and more. The solutions are not too difficult to figure out, and the enemy are not insurmountable (at least at the default difficulty level). The most compelling component of this game is the story. 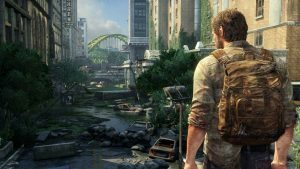 The creative forces at Naughty Dog have reached back into the characters’ pasts to develop the traits that these people possess — something that a good writer will do. There’s a reason why characters act the way they do, and the programmers have not only created a backstory for Joel, Ellie and others — they have embraced it. 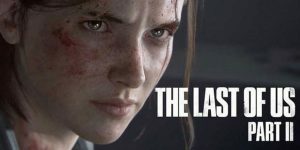 It gives meaning to this game (much like THE WALKING DEAD) and I found myself torn apart as I lived the evolving father/daughter relationship in THE LAST OF US. As time passes the story evolves for the two, and I found the relationship emotional, poignant, and real. Little touches added by the creators (Joel’s watch, “the view,” and more) added depth to the story. Additionally, the graphics, art design, menu interface, sound design and score all contributed to the atmosphere and story. The female characters in the story are incredible. They are not victims, they’re not present simply for the men to save. They participate equally (if not moreso) in the quest to survive, and indeed Ellie often has to repeatedly save Joel’s life, something which at first he can’t quite accept. The women in THE LAST OF US are universally tough people and the game does not sexualize them. I loved that. At times the player controls Joel, at times Ellie. Both characters work hard to survive, and Ellie goes through hell in the storyline, but she’s got grit. I know there’s a sequel coming, and I will definitely purchase it, but it’s going to be difficult to top this, or even come close. That being said, I can’t wait to try it. My one criticism of Part 1 might be that the reason why Ellie is important to the scientists lacks the originality in the rest of the story. Despite this, and because of the overwhelming positives evident in the game, I highly recommend THE LAST OF US. This along with PREY and ALIEN: ISOLATION are three of the most involving, gripping, and wrenching games I’ve ever played. THE WAR BENEATH — Now Available Wherever Books Are Sold! Shortlisted for the 2018 GLOBAL THRILLER and CLUE Awards!